Chichagof Dream, the fifth ship in the Alaskan Dream Cruises fleet, is an intimate four-deck vessel formerly owned and operated by Clipper Cruise Lines and Cruise West under the names "Nantucket Clipper," "Spirit of Nantucket" and "Spirit of Glacier Bay." With a passenger capacity of 74, Chichagof Dream will become the largest ship in Alaskan Dream Cruises' fleet upon its June 2016 debut. Following a 2015 refit at the company's Sitka shipyard, Chichagof Dream was equipped with expansive viewing decks located at the front and aft of the ship, as well as a forward-facing lounge with floor-to-ceiling windows. Other renovations included new carpets and furnishings in public spaces and cabins. The ship's inaugural season will offer seven-, eight- and 10-night sailings, with an emphasis on "active exploration" of Alaska's various landscapes and cultures. 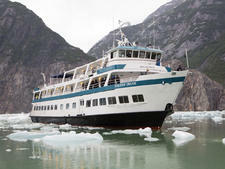 Activities will include wilderness hiking, scenic cruising and cultural immersion in off-the-beaten-path ports. Chichagof Dream cruise fares include all meals and onboard accommodations, scheduled shore excursions and airport transfers, the use of outdoor Alaskan gear (including jackets, pants and boots) and standard onboard services. 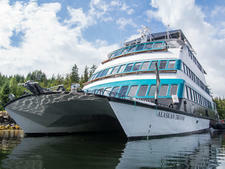 Chichagof Dream offers 37 cabins, several of which can accommodate third and fourth passengers. Split among five cabin categories, all cabins include hair dryers, fans, Alaska-crafted soaps and shampoos, and a pair of high-powered binoculars. Deluxe Suite: Approximately 218 square feet apiece, each of the two Deluxe Suites on Chichagof Dream features a large picture window, a closet, two private bathrooms with showers and a queen bed. Two in-cabin chairs can be replaced with one twin bed -- or one twin bunk bed -- to accommodate third and fourth passengers. Deluxe: The three Deluxe cabins, which measure 155 square feet, each have one queen bed (convertible to two singe beds), a large picture window, closet and a private bathroom with a shower. AAA: Measuring in at 109 square feet, the 16 AAA cabins each feature a queen bed (or two twin beds), a large picture window, closet and a private bathroom with a shower. AA: The 12 109-square-foot AA cabins on Chichagof Dream each include two twin beds that cannot be pushed together, a picture window, closet and a private bathroom with a shower. A: The smallest accommodation onboard at 105 square feet, the A cabin comprises two twin beds that cannot be converted into one larger bed, a porthole window, wardrobe and a private bathroom with a shower. 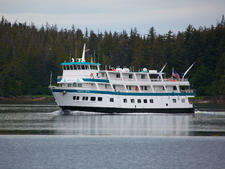 There are four A cabins onboard Chichagof Dream.